Go here to download an H&M coupon for 50% off the lowest priced item when you buy 3 items (good until the 27th). Gap has BOGO half off pants till March 1st. You can even combine men's and women's pants. Go here for Macy's coupon good for 20% off $100 jeans purchase. Men's Wearhouse still has their BOGO Free Designer Suit Sale. Aerosoles boots are $29.99 - $59.99. Look for the cute ankle moccasin boot. American Eagle Outfitters has a sale on T's, BOGO $10. Banana has 20% off any $100 purchase, ends today. Happy shopping. 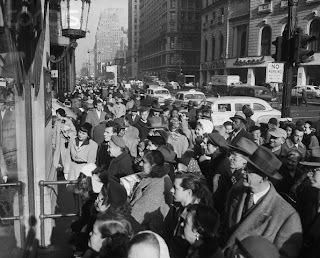 Updated photo: Crowds gathered for Christmas shopping at Herald Square, 12/18/1952. Found on Corbis. So do you think they will all have to discount in the next few months like they did 4th quarter of last year? I wanna to buy a lot there! Half off men's pants? I wanna see that, esp if they have cute butts! I really need new clothes. I have becme a bag lady. So these sales are a beautiful thing! Hi there-great bargains, well done for sharing!! I often do browsing on the internet to know about latest trends in mens fashion. but I have never seen so much variety in mens clothing and mens suits at discounted prices. I am so excited n looking forward to buy these items very soon!! !